Holiday Express: Toys and Trains from the Jerni Collection, now on view through February 25, 2018. A magical wonderland awaits visitors with the return of this holiday tradition. Featuring hundreds of toy trains, figurines, and miniature models from the renowned Jerni Collection, the exhibition’s immersive scenes and displays transport young and old alike to a bygone era. Holiday Express begins at the West 77th Street entrance, where trains appear to roar through the Museum with the help of four large-scale multimedia screens, and extends through large swaths of the first floor. Arthur Szyk: Soldier in Art, on view through January 21, 2018. Arthur Szyk, the great 20th-century activist in art, confronted the threats that filled the years around World War II—Nazism, the escalating plight of European Jews, Fascism, Japanese militarism, and racism—with forceful artistic depictions caricaturing Hitler, Mussolini, and Hirohito as the evil architects of their regimes’ destructive and inhumane policies. More than 40 politically incisive works on view underscore the Polish-born artist’s role as a “one man army” fighting odious policies and protagonists and advocating for civil and human rights. American Visionary: John F. Kennedy’s Life and Times, on view through January 7, 2018. Commemorating the 100th anniversary of his birth, American Visionary: John F. Kennedy’s Life and Times brings together more than 75 images that capture the dramatic scope of Kennedy’s life culled from the John F. Kennedy Presidential Library, the John F. Kennedy Library Foundation, Getty Images, private collections, and the Kennedy family archives. No single politician was photographed more than Kennedy—from his first congressional bid as a decorated war hero in 1946 and his fairy-tale wedding to Jacqueline Bouvier in 1953 to his run for the White House in 1960, his subsequent role as commander-in-chief, and his tragic death in Dallas in 1963. Mapping America’s Road from Revolution to Independence, now on view through March 11, 2018, showcases hand-drawn and engraved maps from the 18th and early 19th centuries that illuminate the tremendous changes—geographic, political, and economic—that occurred before, during, and just after the Revolutionary War. The exhibition features rarely displayed manuscripts and printed maps from New-York Historical’s own premier collection, including the original manuscript surveys of Robert Erskine, Geographer and Surveyor General of the Continental Army, and his successor Simeon De Witt. Also on display is John Jay’s personal copy of John Mitchell’s Map of the British and French Dominions in North America (1755) to which red lines representing proposed boundaries were added during the negotiations of the Treaty of Paris, 1782–83. This exhibition was organized by the Norman B. Leventhal Map Center at the Boston Public Library as We Are One: Mapping America’s Road from Revolution to Independence . Hotbed, on view through March 25, 2018. In the early 20th century, Greenwich Village was a hotbed of political activism and social change—where men and women joined forces across the boundaries of class and race to fight for a better world. At the heart of the downtown radicals’ crusade lay women’s rights: to control their own bodies, to do meaningful work, and above all, to vote. Celebrating the centennial of women’s right to vote in New York and on view in the Joyce B. Cowin Women’s History Gallery, Hotbed features immersive installations and more than 100 artifacts and images—drawn from New-York Historical’s archives and several private collections—that bring to life the neighborhood’s bohemian scene and energetic activist spirit. The Vietnam War: 1945 – 1975, on view through April 22, 2018. A groundbreaking look at one of the most controversial events of the 20th century. Featuring interpretive displays, digital media, artwork, artifacts, photographs, and documents, The Vietnam War: 1945 – 1975 provides an enlightening account of the causes, progression, and impact of the war. Spanning the duration of U.S. involvement in Indochina, the narrative incorporates perspectives covering both the home and the war fronts. Displays touch upon the Cold War, the draft, military campaigns initiated by both sides, the growth of the antiwar movement, the role of the president, and the loss of political consensus. Throughout the exhibition, visitors explore themes of patriotism, duty, and citizenship. Key objects include a troopship berthing unit, interactive murals, vibrant antiwar posters, artwork by Vietnam vets, a Viet Cong bicycle, the Pentagon Papers, and news and film clips. Audubon’s Birds of America Focus Gallery. In this intimate gallery, visitors see first-hand John James Audubon’s spectacular watercolor models for the 435 plates of The Birds of America (1827–38) with their corresponding plates from the double-elephant-folio series, engraved by Robert Havell Jr. Each month, the exhibition rotates to highlight new species—featured in the order they appear in Audubon’s publication—which showcase the artist’s creative process and his contributions to ornithological illustration. Other works from New-York Historical’s collection, the world’s largest repository of Auduboniana, illuminate Audubon’s process, and bird calls, courtesy of The Macaulay Library at the Cornell Lab of Ornithology, echoing through the gallery animate the environment. In December, we welcome the Yellow-billed Cuckoo, and in January, Prothonotary Warbler will be on display (ongoing). New Fourth Floor: Objects Tell Stories, the Gallery of Tiffany Lamps, and More. Explore American history through stunning exhibitions and captivating interactive media on our transformed fourth floor. Themed displays in the North Gallery present a variety of topics—such as slavery, war, infrastructure, childhood, recreation, and 9/11—offering unexpected and surprising perspectives on collection highlights. Touchscreens and interactive kiosks allow visitors to explore American history and engage with objects like never before. As the centerpiece of the fourth floor, the Gallery of Tiffany Lamps features 100 illuminated Tiffany lampshades from our spectacular collection displayed within a dramatically lit jewel-like space. Within our new Center for Women’s History, visitors discover the hidden connections among exceptional and unknown women who left their mark on New York and the nation with the multimedia digital installation, Women’s Voices, and through rotating exhibitions in the Joyce B. Cowin Women’s History Gallery. Objects from the Billie Jean King Archive are also on view (ongoing). Collector’s Choice: Highlights from the Permanent Collection. Since 1804, the New-York Historical Society has been welcoming to its collection some of the most esteemed artworks of the modern world. Collector’s Choice: Highlights from the Permanent Collection showcases a selection of paintings that reflect the individual tastes of several New York City collectors who donated their holdings to New-York Historical. Joining Picasso’s Le Tricorne ballet curtain are featured American and European masterpieces spanning the 14th through the 21st centuries from Luman Reed, Thomas Jefferson Bryan, and Robert L. Stuart, including colonial portraits of children, marine and maritime subjects, and an installation showcasing recently collected contemporary works (ongoing). The Museum will be closed on Monday, December 25 and will close at 3 pm on December 24 and 31. The Museum will be open on Monday, January 1 and on Monday, January 15, 2018. The Museum will open at 3 pm on Saturday, January 20. Admission: Adults: $21; Teachers and Seniors: $16; Students: $13; Children (5–13): $6; Children (4 and under): Free; Pay-as-you-wish Fridays from 6 pm – 8 pm. 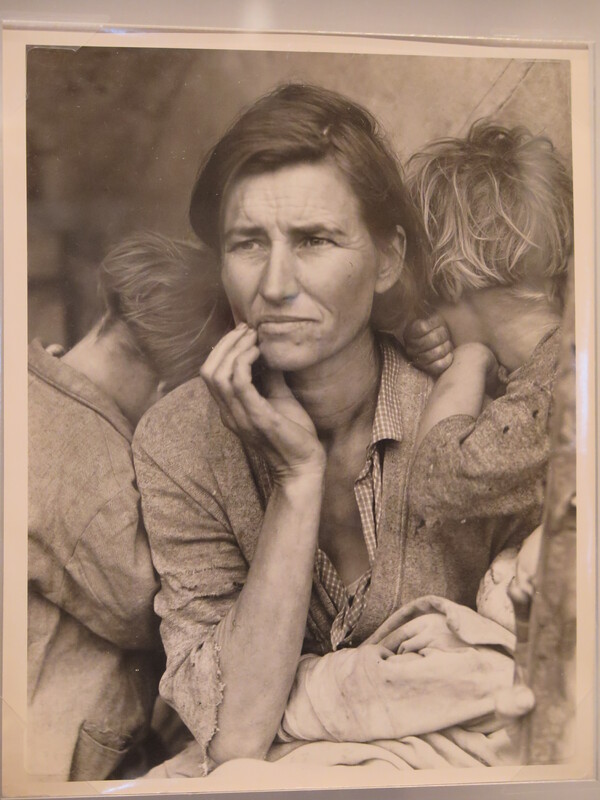 Dorothea Lange’s iconic photo, Migrant Mother, Nipomo, California, 1936, from the collection of the Kalamazoo Institute of Arts ( Gift of the Photo Guild) will be featured in NCMA’s “Light Works: 100 Years of Photos”, here captured when one of the original 8x10s was exhibited at New York Public Library (Karen Rubin, goingplacesnearandfar.com). From November 19, 2016 to March 5, 2017, all of Nassau County Museum of Art’s galleries are devoted to the art of photography. On view in the Main Galleries on the first floor are two exhibitions drawn from the collection of the Kalamazoo Institute of the Arts (KIA), Kalamazoo, Michigan: Ansel Adams: Sight and Feeling and Light Works: 100 Years of Photos. On view in the Second Floor Galleries is New Photos: Long Island Collects, important photographic works of the last half century from private Long Island art collections. New Photos: Long Island Collectsfocuses on significant photographic works created from the 1960s through the present day. Historically, photography has been used as a documentary medium to tell a story, Using the malleable medium of the photograph, artists have often enhanced or staged their works to convey a story, create emotion, or otherwise touch the viewer in a significant manner. This exhibition presents a survey of photographic works from private collectors. Among the artists included in New Photos: Long Island Collects are John Baldessari, Matthew Barney, Robert Mapplethorpe, Vic Muniz, Cindy Sherman and William Wegman, among many others. The Museum is offering a variety of public programs to amplify the experience of visiting these three exhibitions. Two films are screening daily: Stryker’s America: Photographing the Great Depression and Cartier-Bresson’s Century. Three Brown Bag Lectures illuminate the art and the artists included in these exhibitions. Other public programs are inspired by the exhibitions: Sketching in the Galleries, and The River, a concert performed by the musical ensemble ETHEL. The Museum’s family programs from November 19 to March 5 similarly draw inspiration from the exhibitions: Neiman Marcus Family Sundays, February Break for Art and two Super Family Sunday offerings, Winter Wonderland and Merrynaking in a Gold Coast Mansion. For further information on these programs, visit the Museum’s website, nassaumuseum.org/events, after November 6. New-York Historical Society, the oldest museum in NYC, offers fascinating exhibits © 2015 Karen Rubin/news-photos-features.com. This holiday season, the New-York Historical Society transforms into a magical wonderland with a dynamic installation from its renowned Jerni Collection of model trains, scenic elements, and toys from a bygone era. Featuring several treasures exhibited for the first time since New-York Historical acquired the collection, Holiday Express unfolds over a broad swath of the first floor and continues throughout the lower-level DiMenna Children’s History Museum. With the aid of theatrical lighting, an ambient audio “soundscape,” and other visual effects, visitors are engaged in an all-new and captivating holiday experience. Organized by New-York Historical’s Mike Thornton, Assistant Curator of Material Culture. Superheroes are a part of our daily lives, engaging our imaginations on the pages of comic books, on television, and movie screens, as well as across the Broadway stage and in the virtual world of gaming. Since their introduction in the late 1930s, superheroes have been societal role models, inspirational, and enviable. Based on mythological archetypes, they navigate the twists and turns of modern life. Through comic books, original drawings, posters, video clips, costumes, early merchandise, and props, Superheroes in Gotham tells the story of comic book superheroes in New York City; the leap of comic book superheroes from print to radio, to television, and ultimately to film; the role of fandom, including the yearly mega-event known as New York Comic Con; and how superheroes continue to inspire the work of contemporary comic book artists, cartoonists, and painters in New York City. Organized by New-York Historical’s Debra Schmidt Bach, Associate Curator of Decorative Arts, and Nina Nazionale, Director of Library Operations. The New-York Historical Society celebrates New York’s central role in the digital revolution, highlighting the pioneering work and technological innovations that have transformed daily life. Silicon City presents New York as a technological hub where the intersection of commerce and innovation gave rise to the first computers and tech companies. Featuring more than 300 artifacts from the late-1800s through the 1980s, Silicon City will include early computers and telecommunications hardware, archival materials, photographs, digital artworks, and interactive experiences that immerse visitors in the decades-long evolution of technology. Organized by New-York Historical’s Chief Curator Stephen Edidin with assistance from Research Associate Cristian Panaite. After conservation and exhibition at the J. Paul Getty Museum and at the Art Gallery of Ontario, the New-York Historical Society’s Madonna and Child Enthroned with Ten Saints: Maestà is back on Central Park West. Painted circa 1330–34 by Taddeo Gaddi, the major disciple of Giotto, this panel was originally the central section of a triptych with two shutters (sportelli). Following new research the Maestà will be exhibited with the two double-sided wings from a private collection that have been linked to it. One features the artist’s amazing solar eclipse (Gaddi was temporarily blinded by one). Its frame will also be reconstructed and its conservation highlighted. In addition, this exhibition will showcase other 14th- and early 15th-century Italian panels donated to N-YHS in 1867 by Thomas Jefferson Bryan, a pioneering New York collector of Italian “primitives,” (i.e., painters before Raphael). Organized by Roberta J.M. Olson, Curator of Drawings, New-York Historical Society. The show positions Picasso’s curtain in a dialogue with other New-York Historical Society objects, including paintings from the European tradition that provide background to the artist’s work as well as to the traditions against which the revolutionary artist rebelled. Other thematic threads pivot around dance subjects and explore roughly contemporary American paintings, sculpture, posters, and watercolors. Among the works included are examples by William Adolphe Bouguereau, Will H. Bradley, Philippe de Champaigne, Jean-Léon Gérôme, Childe Hassam, Malvina Hoffman, Ricardo de Madrazo y Garreta, Elie Nadelman, Edward Penfield, Maurice Prendergast, John Sloan, and Adriaen van Utrecht. Organized by Roberta J.M. Olson, Curator of Drawings, New-York Historical Society. In an intimate conversation, Judith Miller turns her reporting skills on herself and her career, discussing her early years at The New York Times, her controversial work regarding Iraq’s weapons of mass destruction, and the decisions she made during the Scooter Libby investigation. Since her introduction in 1941, Wonder Woman has remained the most popular female superhero of all time, but the history behind her creation has remained largely unknown. American History Book Prize winner Jill Lepore uncovers the origin of one of the world’s most iconic superheroes and how it holds within it a fascinating family story, as well as a crucial connection to 20th-century feminism. From the assassination of William McKinley in 1901 to Bill Clinton’s last night in office in January 2001, the American presidency—and the nation, as a whole—experienced a tremendous growth in power and influence. Celebrated presidential historian William E. Leuchtenburg chronicles the presidents of the past century, highlighting their moments of high drama and triumph. In June 1940, General Charles de Gaulle showed that sublime heroism was possible even during the chaos surrounding the Fall of France. Andrew Roberts discusses de Gaulle’s leadership, showing how his response to that catastrophe was always admired by Winston Churchill and Franklin Roosevelt, even while they clashed with his rebarbative personality. In 1913, after a series of disastrous financial panics shook the nation, Congress was persuaded to approve the landmark Federal Reserve Act. Renowned financial author Roger Lowenstein reveals the rich history and key players behind the drama-filled creation of America’s central bank, which ultimately enabled the young country to become a global financial powerhouse. After making Georgia “howl” by marching his army from Atlanta to the sea, Union General William T. Sherman led an even more destructive march—through the Carolinas. Join three eminent historians as they explore Sherman’s devastating follow-up campaign to break Confederate resistance and end the Civil War. Founded in 1804, New-York Historical is the oldest museum in New York City. New-York Historical has a mission to explore the richly layered political, cultural and social history of New York City and State and the nation, and to serve as a national forum for the discussion of issues surrounding the making and meaning of history. It is located across 77th Street from the Museum of Natural History. 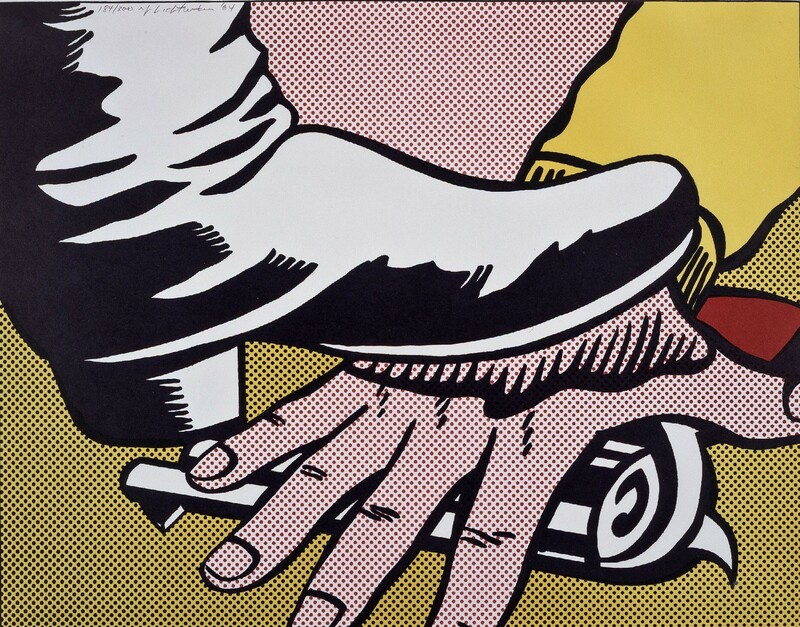 Roy Lichtenstein, Foot and Hand, 1964, a gift of Mr. and Mrs. Samuel Dorsky, will be exhibited as part of the Nassau County Museum of Art’s “Out of the Vault”. In celebration of its 25th anniversary, Nassau County Museum of Art is presenting Out of the Vault: 25 Years of Collecting, its first comprehensive exhibition of works from the permanent collection. 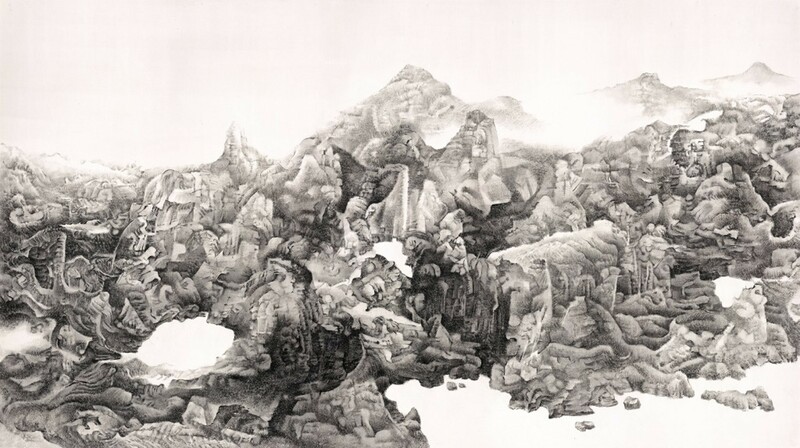 It will be on view March 21 to July 12, 2015. This presentation highlights patrons’ numerous gifts to the Museum over the last quarter century that have never, or rarely, been exhibited. Each gallery space within this multifaceted presentation will focus on different themes such as past and present portraiture, great traditions in paintings, post-war prints and vintage posters of many eras. Exploring a diverse range of artists that are strongly represented in the Museum’s collections, this exhibit includes works by naturalist John James Audubon, photographer Larry Fink, as well as Pop Art icons Marisol Escobar, Robert Indiana and Larry Rivers, among others. Nassau County Museum of Art is located at One Museum Drive in Roslyn Harbor, just off Northern Boulevard, Route 25A, two traffic lights west of Glen Cove Road. The museum is open Tuesday-Sunday, 11 a.m.-4:45 p.m. Docent-led tours of the exhibition are offered at 2 p.m. each day; tours of the mansion are offered each Saturday at 1 p.m.; meet in the lobby, no reservations needed. Tours are free with museum admission. Family tour and art activities are offered Sundays from 1 pm; free with museum admission. Call (516) 484-9338, ext. 12 to inquire about group tours. Admission is $10 for adults, $8 for seniors (62 and above) and $4 for students with ID and children aged 4 to 12. Members and children under 4 are admitted free. The Museum Store is open Tuesday through Sunday, 11 a.m. to 4:30 p.m. Call (516) 484-9337 for current exhibitions, events, days/times and directions or log onto nassaumuseum.org.